There are a few things you would always consider when planning your dashboard software implementation. For a start, it is quick software deployment within your environment and a quick learning curve for dashboard creators and end-user. Ability to connect to your data sources and retrieve data that would be base for dashboard visualizations in a comprehensive and user-friendly manner. Dashboard features as filtering, slicing and deeper analysis are more than welcome when dashboard meets end-user. From time to time, user love to subscribe to the dashboard and receive fresh data on email at the scheduled time. 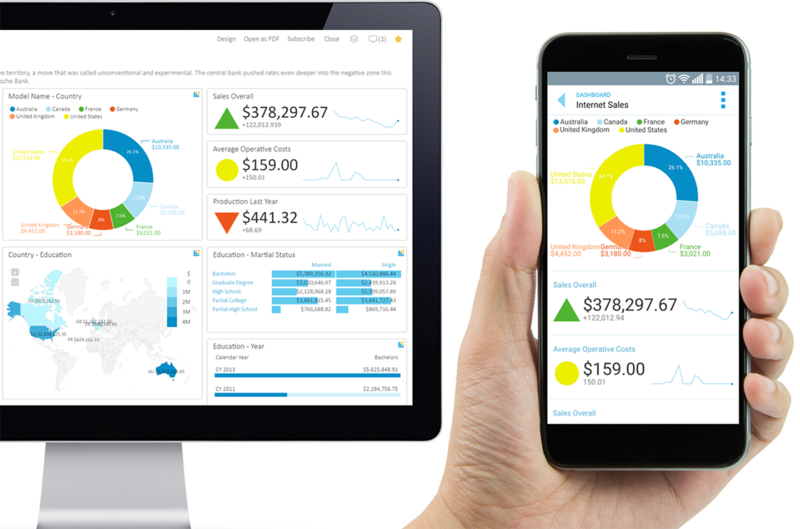 Accessing dashboards from mobile devices or integrate dashboards to your own application will add additional values to your dashboards software environment. 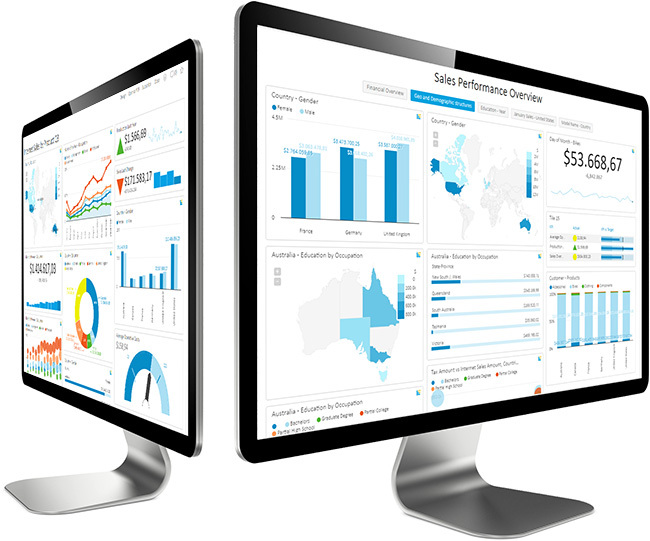 Overview of business dashboard software usage and design with Kyubit Business Intelligence. Business Dashboards created with Kyubit dashboard software presents visualizations of OLAP and SQL databases data and are accessible using a web browser for all authorized users. 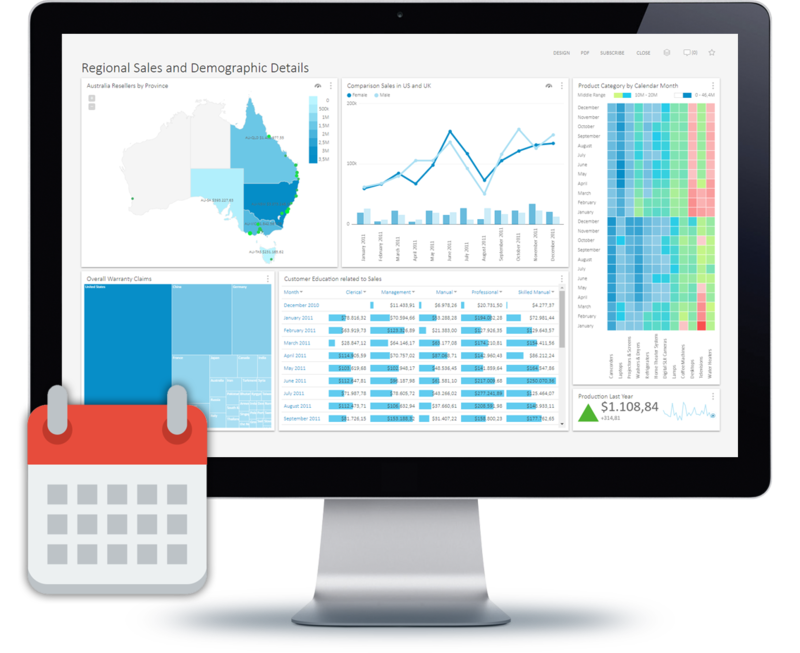 Drag-and-drop dashboard tiles and set its data feed to one of created queries or analyses that would be used as data source for dashboard tile visualization. Dashboard tile could be a chart, KPI or one of the available metric visualizations that would most appropriate to give expected insight. Kyubit dashboard software can schedule dashboard delivery to recipients using email as embedded visualizations or attached PDF file, providing a proactive aspect of your dashboards platform. Connect to your Dashboards content with Kyubit Business Intelligence application published on Internet or use local intranet wireless connection. Integrate Dashboards and KPIs within your environment and use the power of data analysis and visualizations, working together with your application requirements. Download of complete setup program (not only setup starter) will be ready in seconds. First, you need to fill in the download form with your name and email address. Kyubit BI setup requires some Windows components to be active, such as Internet Information Server and ASP.NET. If you do not have those features enabled, it will take you an extra minute to configure from Windows features or it will be automatically configured within the setup procedure. Add Data Sources that you will use to connect to your data. 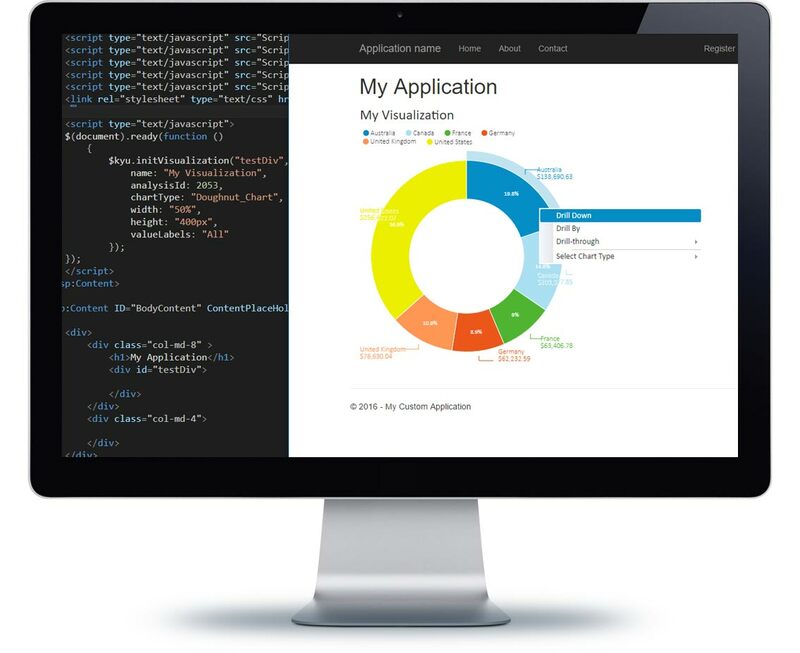 Fill in a simple form with connection details to make permanent data source definition for your SQL, OLAP, and ODBC data sources. Optionally share data sources with other users. Create OLAP analysis by dragging and dropping dimensions and measures to analysis grid view, categories, and series axis. Select any number of measures and filters to narrow analysis insight. Search or browse for required dimension members. Isolate or drill down members to required dimension level. Sort data with advanced sorting options. Create ad-hoc calculated measures, named sets, and use many more analysis options to shape your analysis and results that will make a point. You will love analytic options and features with Kyubit OLAP tools. To check the visuals of your data just switch to Chart view and back, or continue to analyze while in a chart view. Options to dig for data are stunning. Finally, check your Report view to see the values and visuals at the same place for end-users (the boss) to be happy with. Kyubit Analytic Model is a Self-Service BI analytic feature that is quickly created using your data from CSV files and SQL query results. With 'Analytic Models', end-user can create analytics, reports, visualizations, and dashboards, using measures, dimensions, slicers and many features similar to OLAP analysis. To prepare data for dashboard tiles, except visual OLAP analysis, Kyubit dashboard software will offer you to create SQL, MDX, and ODBC queries to get your data to be visualized with dashboard tools. Simply query result will be the base for dashboard visualizations. Result rows will become categories and columns will become series. Add any descriptions or share created queries with your team if necessary. Dashboard design and creating is the simplest thing that even a child could play with. It consists of dashboard columns where you drag and drop various visualizations that you would like to see on your dashboard. There are 20 visualizations of various chart types and metrics. After being dropped to the surface click and select an existing analysis, query, or KPI to bind with a visualization. Now data is displayed on the dashboard immediately and you start to believe you are going to make it. Select the number of dashboard columns and their width, give the dashboard a title and description. Select initial Dashboard Filters (OLAP or SQL based) that slice data on the whole dashboard. Everybody instantly understands pie and doughnut charts, though some Combo and Bubble charts contain more complex data, while geography data is displayed using one of many Geo related charts. Set appropriate users to be authorized to work with the dashboard as readers or contributors and your work is almost done. 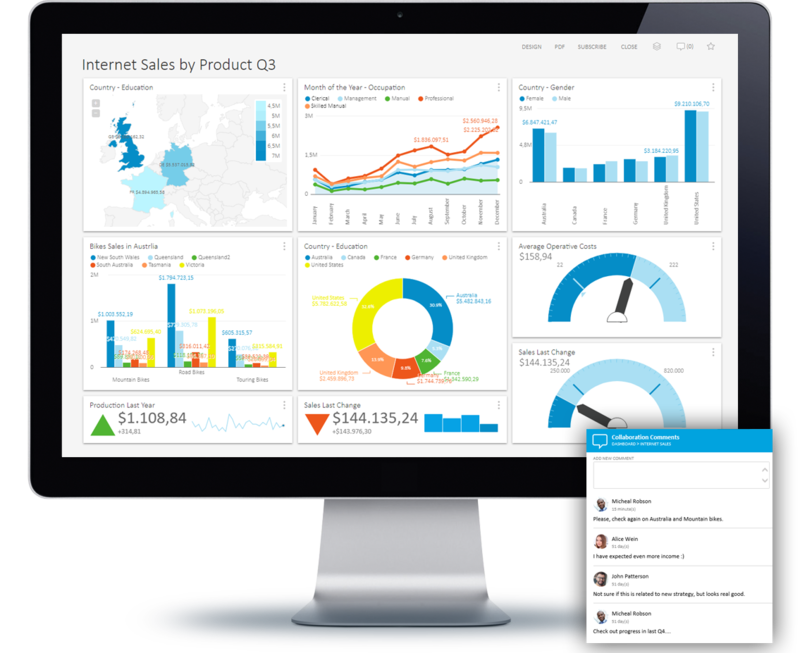 Dashboard design actually calls you to interact, so users will click on dashboard analytic features to drill down data to the point of interest or continue from a single dashboard visualization to full analysis view. Dashboard software without metrics is hardly a dashboard software, it's more like a report. You need metrics to tell you instantly when the dashboard is opened that certain things are going or not going according to expectations. It is like driving a car and looking at how much fuel you have and what speed you’re driving at. The dashboard is not a deep insight into your business, it is a quick peek at your business objectives, but great dashboard software has the ability to give you a deep analysis insight when requested. So if a chart is telling you that sales last month were lower than you expected, you cannot react until you find out the reasons. So you will click on the chart and select to continue with the full analysis in a separate window that will give you full-blown analysis environment to continue drilling the data from the chart to various dimensions until you get clear about why sales have dropped. Imagine that in an everyday business environment you have more than a few applications and databases where a company has all kinds of data records that are relevant to the business. A manager should not jump around from one system to another to get understanding of what is going on. You should prepare him a dashboard, a place where all important indicators and values are on one screen. Furthermore, you can have one high-level dashboard with the most important data, while 'daughter' dashboards are opened on request for a specific segment of the business. KPI is defined by values defining what is a success and what is a failure in the sense of achieving defined goals. Values for both limits could be defined from values that come from analysis and SQL/MDX queries which make them dynamic and by smart engineering, they could last long as a trusted source of information on your business score. Multiple KPIs could be organized to Scorecards, which is simply a list of more than one KPI with its current status and attributes. If the data on a dashboard is important to you to receive at time intervals, fill in a subscription form and receive emails with the dashboard and fresh data from your data sources at scheduled times. Even create conditional subscriptions that will send the dashboard only if one of its KPIs has required status. People will collaborate on dashboard data by adding comments and starting dashboard related discussions. From the moment you send a link to other authorized users and they start to collaborate and discuss all kinds of business-related topics that are finally visible at a click in their browsers you will certainly find this tool a powerful and analytic weapon in your battle to discover and share all data from your database. In most business organizations there is a huge amount of data still waiting to be discovered and bringing significance to your business decisions that previously had low visibility. Having a dashboard where you can click on a pie chart and drill-down a pie segment to other dimensions such as time, product, customers, etc. is a fantastic opportunity for managers and analysts who make business decisions on a daily basis, as they have a garden of their own business truths in front of them. The ability for end users to comment on the BI content will attract users to see and make their own point and contribute to the discussion.